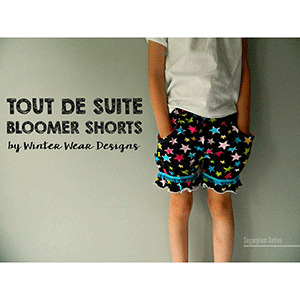 The 'Tout de Suite' Bloomer Shorts are a Beginner Pattern designed to make your daughter comfy all summer long. This pattern is designed for ease and comfort. 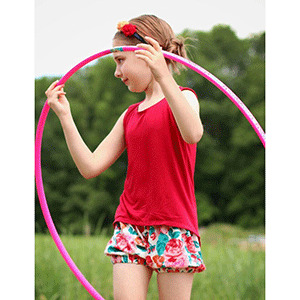 This pattern works perfectly as bloomers for under dresses and tunic tops, as shorts paired with a cute tee or tank top, or as PJ shorts. 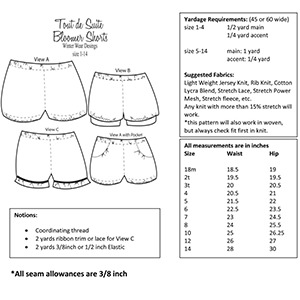 This pattern is available in sizes 18m to 14. Suggested fabrics are cotton jersey, cotton lycra, cotton ribbed, stretch fleece, stretch lace, etc.